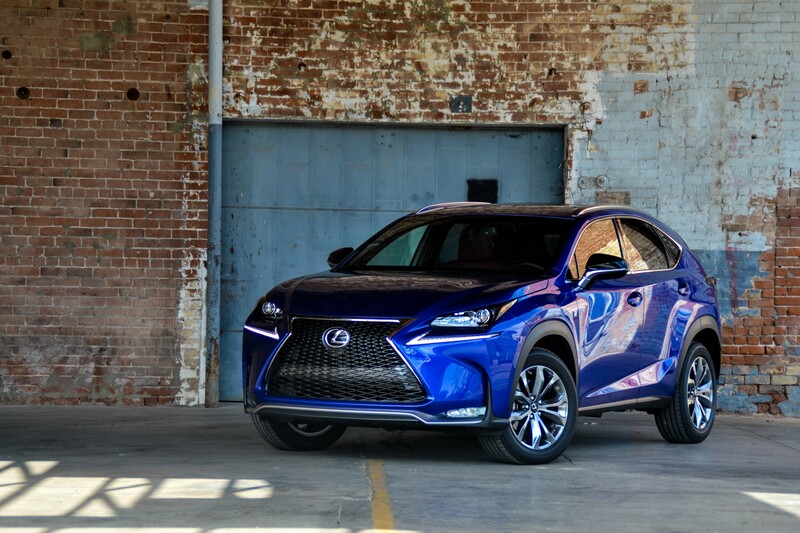 We’ll cut right to the chase – Lexus’ new NX200t looks like something a toddler drew up and with our Ultrasonic Blue paint, there is no conspicuous way to hide from your stalking ex-girlfriend. Now that every luxury automaker see’s potential with a new kind of generation out there, they all want a piece of the pie. Lexus new baby-ute crossover competes alongside its corporate strict Germans, the Audi Q3 and Mercedes-Benz GLA250. Conceived from a five-year olds coloring book, the NX is a head turner, no matter what color you opt for. Finding the right angle through the lens of our Nikon was an impossible conclusion – there are too many jagged edges and curves that makes its shape unique and controversial. And to be honest, we weren’t too sure about its design, until we saw it in person – this is one you’ll have to see for yourself before you get all judgy, judgy. Like any luxury brand, the Lexus NX200t has all the goodies that makes your car sparkle. The oddly shaped HID headlamps, LED daytime running lamps and luminous LED taillights is a surefire way to be noticed after sunset. The large Lexus spindle grille eats as much pavement as a bulldozer. And our fitted 18” F SPORT alloy wheels seemed fitting for its size. Built off the same platform as the Toyota RAV4, you’ll find that’s where the similarities stop and the Lexus influences begin. New to Lexus is the 2.0-liter turbocharged four-cylinder engine. Matted to a six-speed autobox, the NX200t pulls out 235-horsepower and delivers 258lb-ft of torque to the front wheels. At first drive, it’s easy to tell this is Lexus’ first go around with a turbo, (don’t let that cheeky digital turbo gauge in the cluster fool you) there is some noticeable amount of turbo lag just before 2,000 rpms. Even though it weights a pinch less than 4,000lbs, the NX200t has no problem merging into freeway traffic in less than 7 seconds. Minus the lag of acceleration the NX200t performs like a sports sedan in its driving dynamics. Because our tester was the F SPORT model, we were equipped with a smooth operating sport tuned suspension and a sport button on the dash that made our six-speed transmission pretty snappy. Due to the slightly stiffened suspension, handling is noticeably decent – doesn’t sway side to side like a waterbed and there is some decent road feel from the thick perforated leather wrapped F SPORT steering wheel. Finding yourself up on a curvy mountain road, the NX200t is fun and enjoyable – it sprints to life at higher revs and the torque steer pulls you around corners quite eagerly – allows you to have some fun with the G-Meter. Naturally of a Lexus nature, everything was comfortable and smooth riding – as long as you’re not in a hurry. The engine and transmission work well together, the chassis feels solid and well planted, and stopping never seemed to be an issue. By crossover standards the NX200t does surprisingly well on fuel efficiency averaging 22/28/25 (city/highway/combined) – during our duration, we recorded an average of 23 mpg on Premium grade fuel allowing 330 miles of travel distance. Our tester here had a Superman theme to it that took our Ultrasonic Blue exterior and mixed it with our sublime Rioja Red NuLuxe faux leather interior. As the ultra-comfortable body cuddling seats snuggle you to death – take notice to the Starship Enterprise styled interior of odd shapes and curves. Even with its unique design, everything is perfectly in place for easy access from the captain’s chair. Being of Lexus quality, every surface was full of soft touch materials and our metal weaved trim was rather pleasing to the eye. You’d think for a small crossover, space would be limited, but it’s not. The rear seats provided decent leg and head room for larger passengers. And with our optioned Moonroof ($1100), it didn’t take up any roof space. Fitted to our tester was the optional F SPORT Comfort Package ($505) which offered up power adjustable front seats and power adjustable steering wheel with memory settings. If there was a compliant to be had, it’s that at 43-grand our tester didn’t have equipped heated seats – which is not Lexus typical. There is no shortcomings to the NX200t when it comes to latest technology. Our interesting three-dimensional pop-out Navigation ($2140) is top notch with easy-to-use functionality and an amazingly clear back-up camera. We’re getting used to the touch-pad interface but still seems a little finicky to the touch. Our tester also featured a Qi-Compatible Wireless Charger ($250) which requires a special phone case or a special phone. Given a few other options, our tested Lexus NX200t stickered out at $43,398 after destination. That’s not too bad given how expensive Audi and Mercedes can get after hitting to many check marks on the options list. There are a still a few tweaks to be worked out from the turbo, which you easily get use to. Ultimately we find the NX200t is a strong, unique competitor against its German cute-ute competition. Hahaha yes it does! Good thing I cleaned it out before it went back. Those buggers even got under the seats. Hey James, it was good meeting while you were shooting car. Great article! !